Incident Details: A couple walking along the Ullock Pike Ridge, mistook the parish boundary marked on the map as a footpath, and descended towards Dodd Wood. They got into some very difficult ground with thick vegetation, and became lost. The Team sent out a small group to find them, which took some time as they had strayed north towards the Ravenstone Hotel, into Sandbeds Gill. Eventually one of the Team’s search dog handlers got a sight of them, and Search Dog Rona then confirmed where they were. 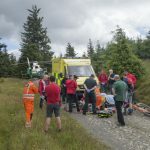 They were helped back up on to the ridge, and then walked off to the Ravenstone Hotel, where a Team vehicle was on hand to transport them to their car at Dodd Wood. 9 Team members – 3 hours 55 minutes.